When you own a company there are many ways a potential customer can judge you before even setting foot into your door. While a good website design represents you in the digital world, the exterior appearance of your company building has exactly the same function in the physical world. The benefits of having a clean commercial building exterior are obvious. If the outside walls are covered in dirt and mould, with windows concealed by cobwebs and smudges, anyone about to conduct business with you might quickly change their mind and walk on. How you value the look of your company might, in the eye of the beholder, also reflect how you value your business and your customers. If you want to ensure that people get the best possible impression of your company and even your style of management, having the exterior of your company building(s) cleaned on a regular basis is non-negotiable. The Blast Away Guys can do it all for you, from sparkling clean windows and signs to mould-free and dirt-free walls to improve the look and presentation of your property. Neglecting the exterior of your business facilities not only keeps customers away. It can also make your building warranty invalid as it causes health risks and hazards to those working inside. Having your building washed regularly in accordance with the warranty specifications will ensure you can continue to grow your business. Lots of dirt and debris on the outside of your building can be an indicator for mould and mildew growing on the inside. While not always visible, this poses a significant health risk to your employees, especially to those with allergies or respiratory illnesses. If you’re located along a busy road, chances are also that your façade is soaking up exhaust fumes and other pollution particles. The only way to protect yourself and your employers from long-term health issues is to get your building thoroughly cleaned. Commercial cleaning companies actually help you keep the cost of ongoing maintenance down. If you let mould, moss and other debris grow along your outside walls too long, they might cause serious damage to your façade which will result in expensive repairs. 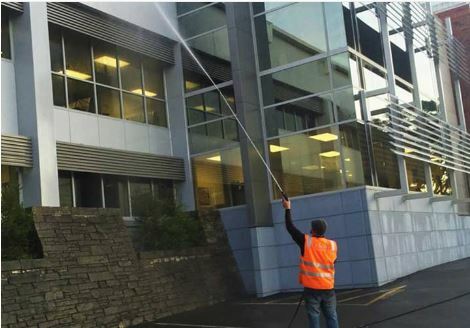 Having your building exterior cleaned with a professional water blast will remove those build-ups and protect your property from deteriorating. Window cleaning is a crucial part of the upkeep of your business property. It’s not just the customer that feels more valued when the appearance is right. Working in a building that is clean and tidy also helps keep your employees healthy and it has a positive impact on their happiness and productivity. Being able to watch the outside world go by through spotless windows is certainly more appealing than staring at fly-filled cobwebs all day. Especially when it comes to multi-story buildings it’s better to call in the experts. Building cleaning companies have the knowledge and experience to fulfil this task safely and efficiently. Depending on the material and size of your company signage this definitely needs to be included in a regular cleaning schedule. Environmental pollution such as exhaust fumes and grime can damage any sign over time and decrease the visual value of your business. Customers might decide to shop elsewhere and potential clients might not even notice a dirty, grubby and damaged sign. Having your signs cleaned regularly will increase longevity and ensure that your customers have a positive image of your brand in mind. One of the most crucial times to have your building exterior cleaned thoroughly is in spring. Winter in New Zealand can be harsh depending on your location. They are cold and damp, which makes your buildings a perfect breeding ground for moss, mould and fungus. Getting rid of these build-ups will protect your building for the seasons to come, ensure that your employees have a safe work environment and that your customers are happy and confident walking through your door, trusting you with whatever business you conduct.